Whether it's on runways or music award shows, one thing is certain about the crop top: it's back in a big way. This is especially true in the swimsuit world, with the crop top popping up in all of the best designer swimwear collections. Rocking a crop top shows off your unique sense of style, as well as your ability to pair the crop top with other amazing wardrobe items. Nothing is as fun as a crop top swimsuit during the summer. This footloose and fancy fashion lets everyone know that you possess a tremendous amount of style. When it comes to amping up your appeal, there's nothing better. 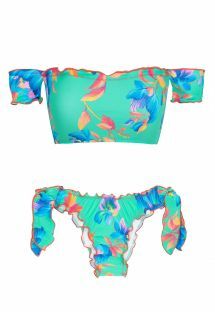 If you're looking for more of a sporty look, something ultra-feminine or the very latest bikini trend, the crop top is ideal! Indulge yourself with one of our printed, dual fabric or racer-back models, the choice is amazing!